Kodak’s ESP 7250 multifunction device (color inkjet printer, scanner, copier) offers home and student users a fun assortment of features for a midrange price. 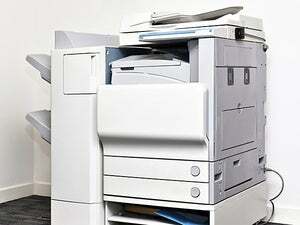 Its low ink costs are appealing, but this device is otherwise an average performer. The ESP 7250 is easy to use from the get-go. You can install it via USB, ethernet, or Wi-Fi; and completing the driver and network installation processes takes just a few clicks. The driver’s photo enhancement capabilities are particularly nice, allowing you to tweak image colors without resorting to profiles. Kodak’s comprehensive Home Center printing, copying, and scanning software is as good-looking as it is capable. The ESP 7250’s control panel is practical and clean. Menus and photos appear on the 2.4-inch color LCD, and you navigate through them by using a four-way rocker button. All of the buttons on the panel are clearly labeled. Though fun features abound on the ESP 7250, its basics are limited. A 40-sheet photo input tray piggybacks onto the main tray (a nice convenience) and the standard automatic duplexer helps you save paper by printing on both sides (not with photo paper, of course). Using Kodak’s Pic Flick app, you can print photos from an iPod touch or iPhone on the ESP 7250. Software for printing from a BlackBerry will be available later. The ESP 7250 lacks an automatic document feeder for the letter-size flatbed scanner, however, and its main paper tray holds just 100 sheets. In our Mac and PC tests, the ESP 7250 ran slower than most competing devices, and not all of its output was worth the wait. Text speed was below average: 3.6 ppm on a Mac and 4.6 pages per minute on a PC. Output quality, though generally crisp, was dark-gray rather than black. Photo print speed was better, at 1.8 ppm. On Kodak’s own special paper, photos looked nice; but the same images on plain paper were faded, yellowy, and grainy. Scan times (measured on the Mac platform) were peppy, and monochrome scans and copies looked good. Color scans, however, appeared choppy, cartoonish, and off-color. Kodak’s ink costs are among the cheapest around. The 10C tricolor cartridge ($18) is rated for 420 pages, or only 4.28 cents per page. The 425-page 10B black cartridge ($10) comes out to 2.35 cents per page. The 770-page 10XL black cartridge ($17) has a higher page yield but only a slightly lower cost per page: 2.2 cents. Kodak did not offer high-yield color cartridges for the ESP 7250 at the time of this review. Kodak ESP 7250’s low ink costs, photo paper tray, and photo quality will appeal to home and student users. Aside from the automatic duplexer, however, its other features and capabilities are unremarkable.